starting now: tuesday . . . I am jumping up & down :) I finally get to share the good news - I will be designing for . . . Thanks so much to Heidi & Scrap Within Reach for choosing me!!!! 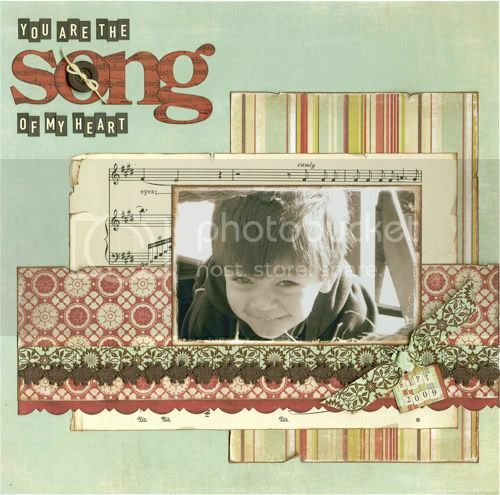 Below is a recent layout I did using their products (some of you may have already seen this one) - just love the distressed feel to these papers!! Check their site out HERE & their blog HERE!!!! Stop back tomorrow for "Wish List Wednesday" & some fun DT projects to share!! a big congrats to you! you are totally rockn' these DTs. :) can't wait to see your future projects! Congrats Julie! You are on a roll girlie! Congratulations Julie that's wonderful news!! HUGE congrats to you. What an adoralbe page. I look forward to working with you! Congratulations! Beautiful work on this lo...love it! Congrats! They are very lucky to have someone as talented as you! Congratulations Julie!! You are one busy lady!! Your awesome talent for sketching and design is being recognized! You deserve it!! :) Love this LO!! Congratulations!! I am so glad we will get to see your talent used in many places! I absolutely love your layout "Song of my Heart", I hope you do not mind, but I plan to lift this, including the title (the title being my favorite part, along with the sheet music paper). My daughter is such a huge fan of Happy Feet and this layout just fits how I feel about her. Thanks for the inspiration!